Uuganaa Ramsay was born in Mongolia and grew up in a yurt, living a nomadic life eating marmot meat and distilling vodka from yoghurt. After winning a place on a teacher-training course she came to the UK, and now lives in Scotland. Uuganaa won the Scottish Asian Women’s Award For Achievement Against All Odds presented by Nicola Sturgeon MSP, Deputy First Minister of Scotland. This award recognises the achievements of a Scottish Asian woman in the face of adversity and challenging circumstances – a true modern day heroine. 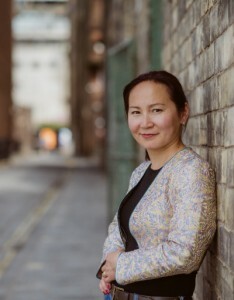 Mongol won the Janetta Bowie Chalice Non-Fiction Book Award from the Scottish Association of Writers. Mongol is her first book. You can find her on Twitter as @Guuye or Facebook at www.facebook.com/MongolMemoir.